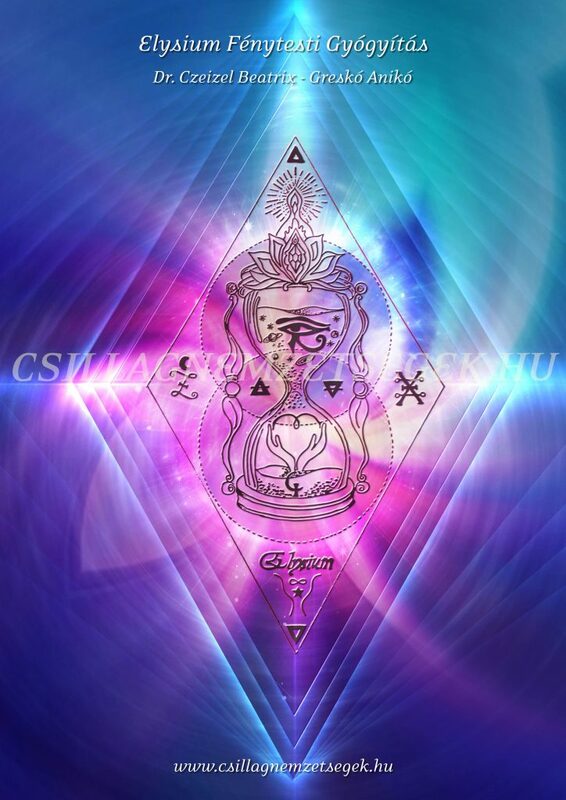 in the wonderful and exceptional mystery of the ©Elysium Light-body Healing, which we created and introduced in January 2019, hoping to help many people with it. The knowledge and the precisely structured method of the ©Elysium Light-body Healing comes from a spiritual community that has been connected with the 7th dimensional world of Antares from the beginning, and which has provided help in all the situations where due to a dramatic cataclysm or collective devastation souls needed to be rescued and healed, on the galactic level and in the life spheres of different planets. The main initiator and teacher of the Priestesses of Elysium and the Healing Community of Elysium is Sophia, the heavenly queen of healing, who has an incredibly deep knowledge and wisdom about all the levels of healing, as she knows the precise choreography and mechanism of pain and suffering. We received the healing keys and the principles of this mystery from Sophia. At the same time, we were deeply touched to connect with Almitra-Mary Magdalene and to receive teachings from Her as well, filled with the same pure and deep love and compassion. She had worked and healed as part of the delegation of Elysium’s community on Lemuria in her life 2000 years ago. Furthermore, the mystery of the Elysium Light-Body Healing includes the healing wisdom of the Pleiadian stars Alcyone, Taygeta, Maya and Electra as well, which we have described in detail in our book Stellar Destinies. The ©Elysium Light-body Healing is a system of a complex series of touches. It operates different release-keys on the levels of the physical body, the ethereal body, the emotional body and the mental body. Through transmitting these special and magically working combinations of touches, the healers we train can help to dissolve and release the energetic patterns behind the different pains and fears on the physical, emotional and mental levels. We open special gates in different layers of the body and the aura field. Through these gates, the energy patterns of pain and fear, which create the physical and the spiritual suffering can be released and discharged. In the meantime, different recognitions can emerge about their real roots and causes. It is important to know that if there is an emotional burden, chronic stress or a distressing situation that lasts for a longer period, at least 3 months according to an energetic law, then it creates a stationary energetic pattern in our aura, in the so-called morphogenetic field. A definite and almost palpable fixed energetic formation can also be formed in our personal energy field if we have to experience an elementary, dramatic and acute situation, due to a sudden loss, for example, an unacceptable disappointment or a financial breakdown. The energetic pattern that is generated by these recurring and powerful events is like an elemental with an individual elementary consciousness and its own internal program, which runs through the same steps and recurring cycles within us all the time. This is the reason why often our chronic physical pains can return along the same choreography, triggered with the same precision. This is also why the very same feelings, thoughts or nightmares can return in our anxiety. This is why the people with panic disorder suffer from attacks of fear and physical symptoms that run through familiar inner cycles. This is also the mechanism that works in the background of the dependencies and addictions. Furthermore, this is why the family disputes are repeated along the same dialogue cycles. It is possible that this is why we cannot really step out of our old mistakes and we unwillingly line up the same old steps, which lead to the same dead end street. The ©Elysium Light-body Healing Mystery revealed a powerful secret and we received the release-keys, which can deconstruct these fixed and recurring energy patterns, which can cause physical or spiritual sufferings, and so the pain- and fear elementals can be eliminated completely and finally from our auras. We believe that it can be very helpful that such recognitions can arrive during the healing, through which we can recognize the choreography and the root of these inner cycles and we can mature our souls to the motion of conscious release. This can be the key to avoid these problems ever to return to us and so we can become capable or the real and lasting change. We wish this healing mystery to bring deep and pervasive healing in the lives of many!